Finally, the United States Supreme Court has spoken. For the purpose of filing a copyright infringement lawsuit, the issue of what constitutes copyright registration was decided last month by the high court. For years, the federal circuit courts have been split when it comes to the issue of, when can you sue for copyright infringement. Some federal circuits, such as the Tenth Circuit Court held in order for a law suit to be filed, there needed to be a valid registration in place, not just an application. Other circuits, like the Ninth Circuits Court, have held that as long as the plaintiff filed a trademark application with the USPTO, that was sufficient. 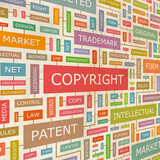 The Supreme Court on March 4, 2019 held that registration of a copyright claim occurs, and a copyright claimant may commence an infringement suit, when the Copyright Office registers a copyright, not when a copyright owner submits the application, materials, and registration fee to the Copyright Office. Fourth Estate Public Benefit Corporation is a news organization that provides online content, for a fee. It licenses articles but retains the copyright in the work. Wall-Street.com secured a number of licenses from Fourth Estate. The contract between the two provided that when the licensing relationship was cancelled, all of Forth Estate’s content was to be removed from the licensee’s website. When Wall-Street cancelled its account, it continued to display the articles licensed by Fourth Estate. In the Fourth Estate, the licensor filed a copyright infringement action against one of its former licensees, the Wall-Street.com. Wall-Street argued that it filed an application with the Copyright Office. The licensor experienced a setback, when the United States District Court for the Southern District of Florida dismissed the complaint. The licensor appealed to the 11th Circuit Court of Appeals, subsequently, the US Supreme granted certiorari. Protect your work. If you create valuable content, secure a registration within 90-days after publication. Avoid being sued. If you enter into a licensing relationship, make sure you follow the terms of the agreement. Going beyond the scope of the licensing relationship can equal copyright infringement. I’m Attorney Francine Ward providing you with information you can use. Law Facebook Fan Page, Twitter Law Page, LinkedIn.